Even though spring is right around the corner, there is still a bit of a chill in the air that a steamy bowl of gluten-free tomato soup can chase right off. 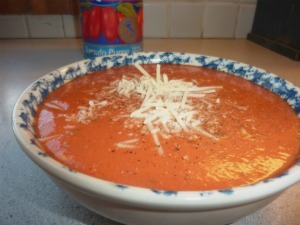 I set out this past weekend to make the perfect bowl of tomato soup – with just enough tanginess, combined with a touch of sweetness. Creamy, but not too thick, and exactly spiced. The quest for this perfect bowl of homemade gluten-free Tomato Soup was easier to come by than originally anticipated, hence the namesake, Quick & Easy Tomato Soup. I like that the ingredients are all basic kitchen staples, and the cost to make it is under $10. For a dairy-free version, or for a less- creamy version, eliminate the sour cream (or yogurt), as well as the grated Parmesan cheese garnish. A perfect lunch? A cup of this soup, paired with a perfectly toasted, ooey and gooey grilled cheese sandwich. In a large saucepan, heat the oil over medium-high heat. Add the chopped garlic and the red pepper flakes. Cook, while stirring constantly, until the garlic starts to lightly brown. Add the pureed tomatoes, V-8 juice, sugar and the chopped basil. Season with the salt and pepper. Reduce heat to medium and cook for about 15 minutes, stirring occasionally. Next add the sour cream or yogurt (if using), stir until blended. Cook for another 5 minutes. 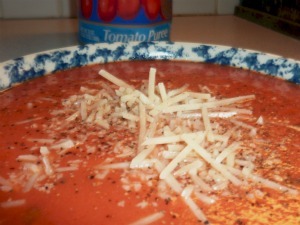 Ladle into individual bowls and top with a sprinkle of grated Parmesan Cheese (omit for dairy free). This entry was posted on Sunday, March 18th, 2012 at 4:24 pm	and is filed under Recipes. You can follow any responses to this entry through the RSS 2.0 feed. You can leave a response, or trackback from your own site. What size can of V8 juice? Thanks for the catch Daryl! I am from South Africa and would like to try your recipe. It just sounds D-E-L-I-S-C-I-O-U-S!!….. but what is V-8 juice?? You could easily substitute tomato juice in the recipe, and if you wanted to add in a bit of a kick for spiciness, put in a splash of hot sauce.